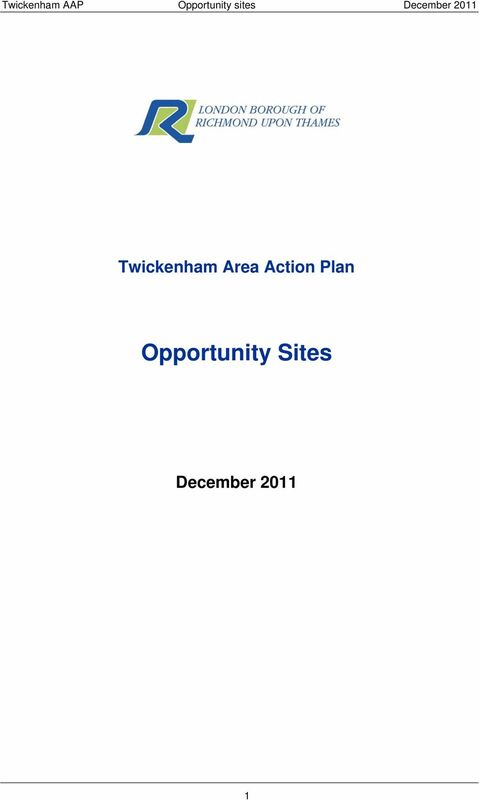 Download "Twickenham AAP Opportunity sites December 2011. 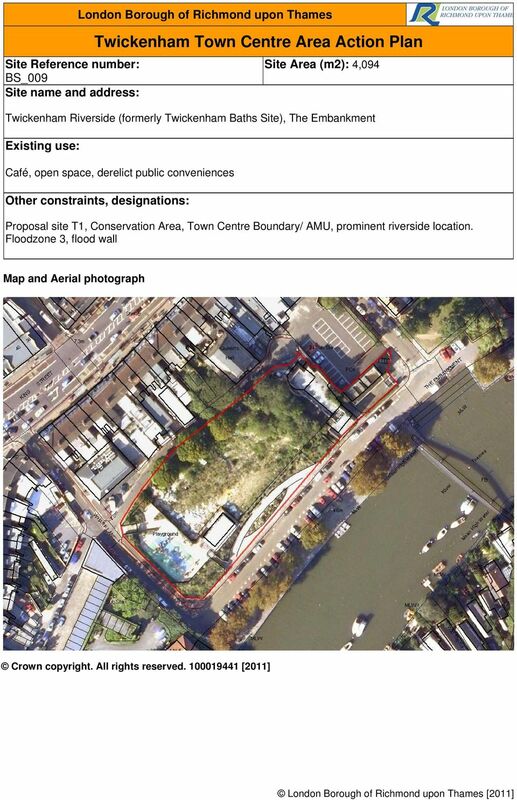 Twickenham Area Action Plan. 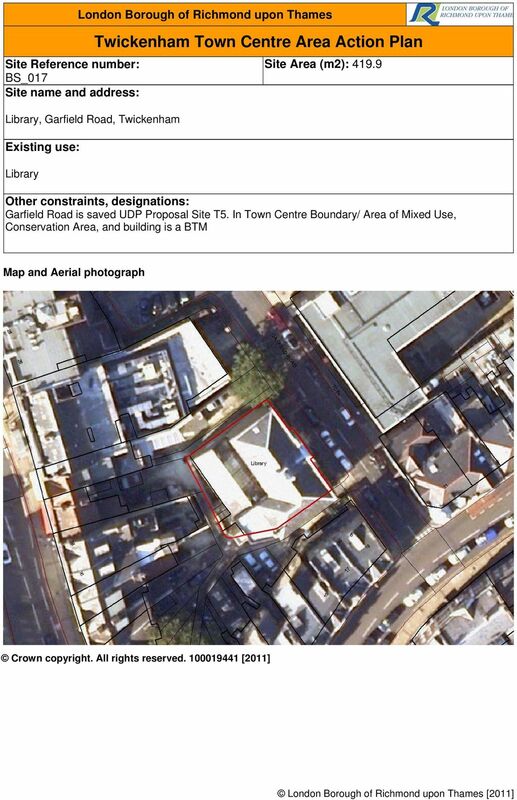 Opportunity Sites"
21 London Borough of Richmond upon Thames Site Reference number: BS_018 Telephone Exchange, Garfield Road, Twickenham Telephone exchange Site Area (m2): 1,755 Garfield Road is saved UDP Proposal Site T5. 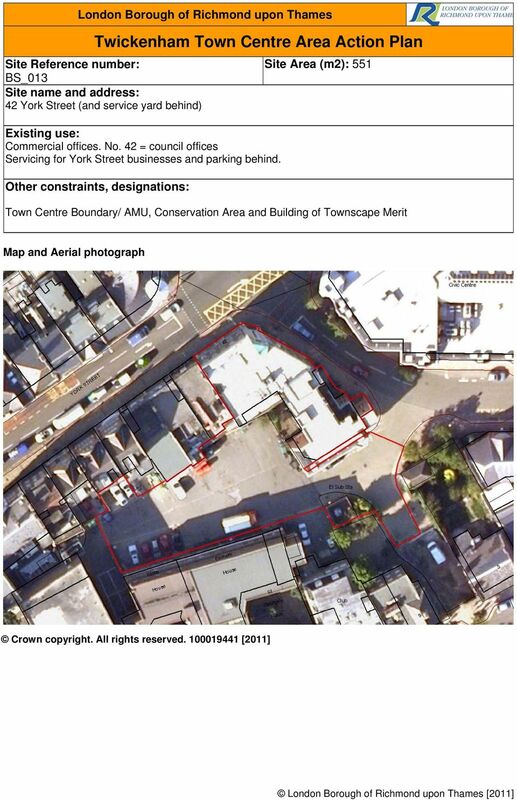 In Town Centre Boundary/ Area of Mixed Use and Conservation Area. 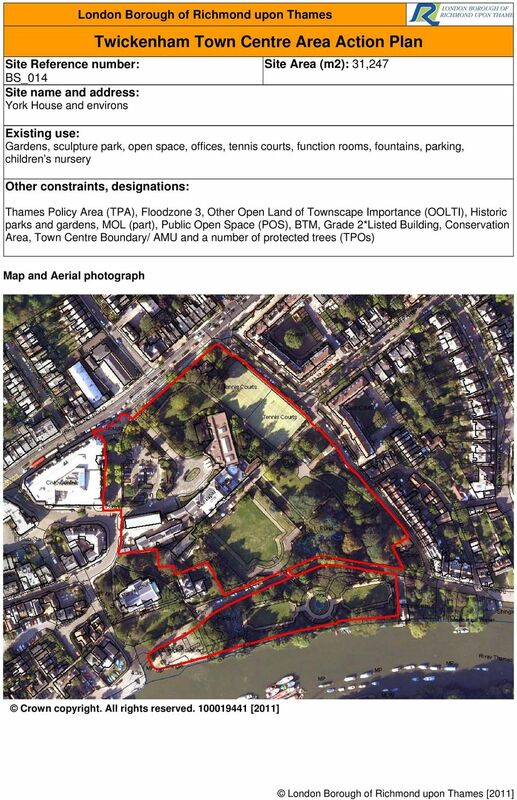 22 London Borough of Richmond upon Thames Site Reference number: BS_ Richmond Road, Twickenham Offices Site Area (m2): 686 In Town Centre Boundary / Area of Mixed Use and Conservation Area. Next door to petrol filling station. 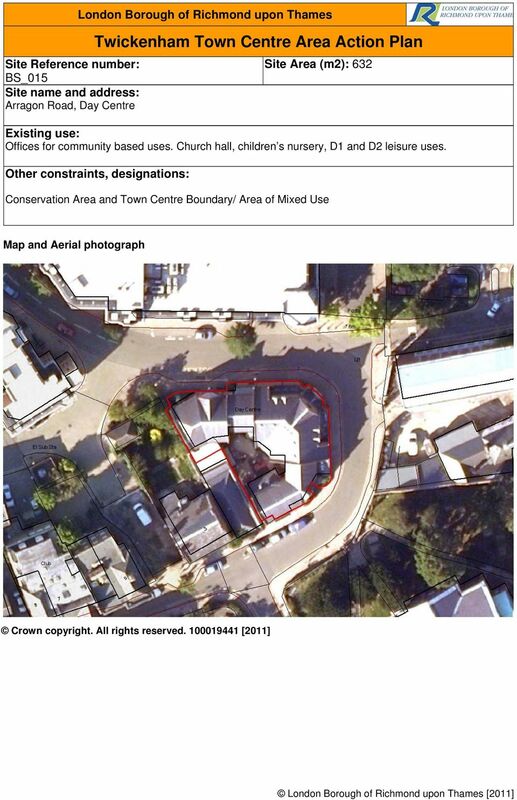 24 Site Reference number: BS_021 London Borough of Richmond upon Thames 121 Heath Road,Twickenham Site Area (m2): 1,698 Vacant Government offices granted permission for redevelopment of the site to provide 22 no. 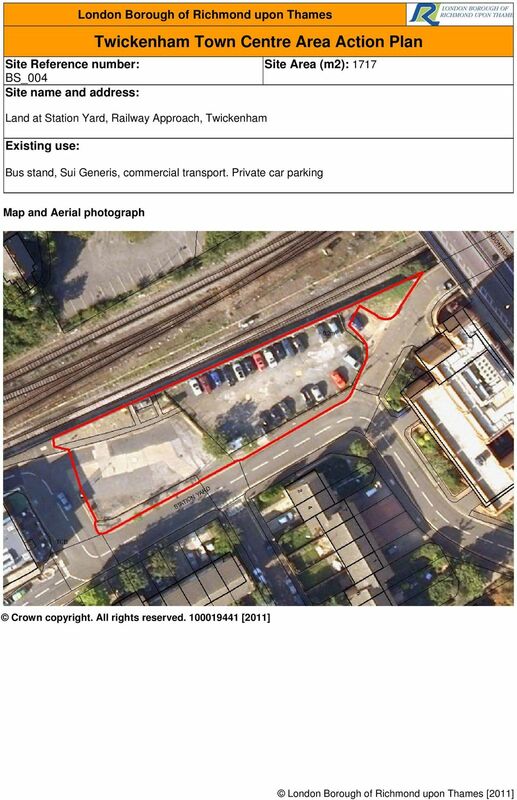 flats and an A1 retail unit at ground floor, car parking with internal access road thereto, cycle, refuse and recycling facilities, landscaping and associated works. 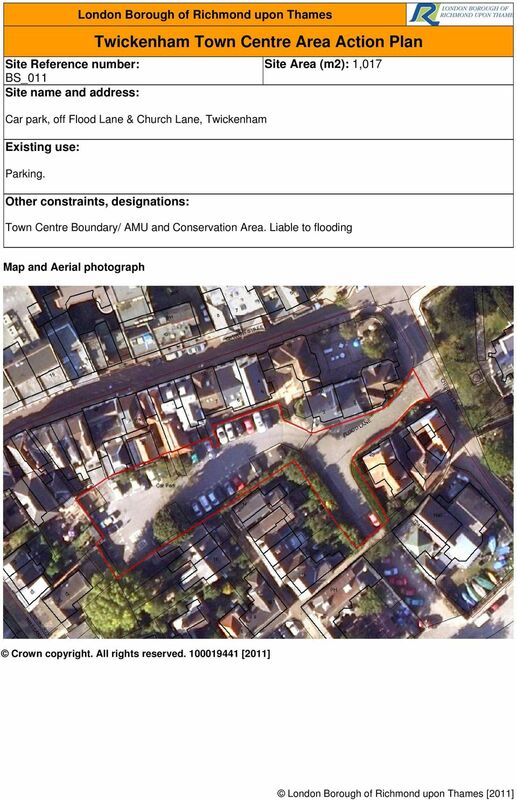 Within the Town Centre Boundary. 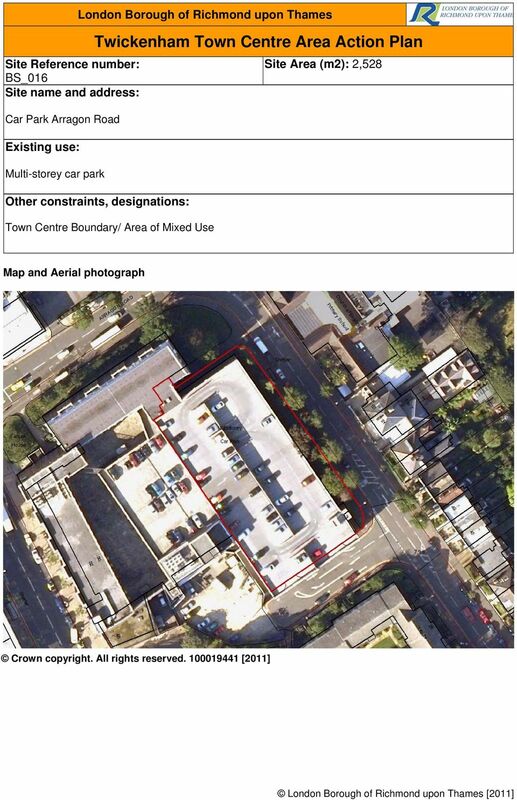 27 London Borough of Richmond upon Thames Site Reference number: Site Area (m2): 2,066 BS_024 Queens House, 2 Holly Road 8 storey office building and 61 car parking spaces In Town Centre Boundary /Area of Mixed Use and Conservation Area. 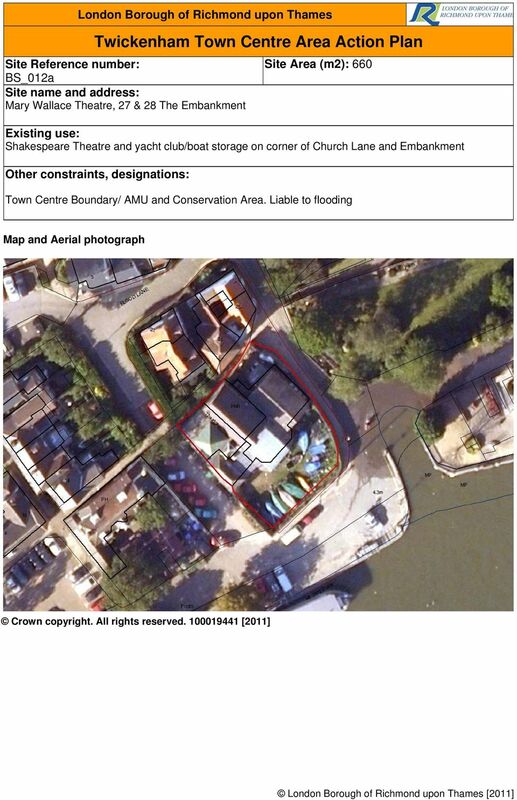 31 Site Reference number: BS_028 London Borough of Richmond upon Thames Garages between 3-5 Clifden Road Site Area (m2): 1,238 Land and lock-up garages. 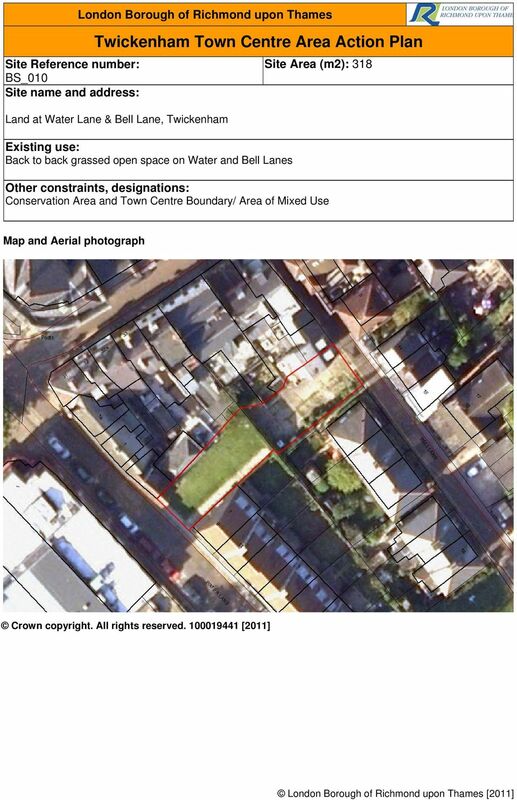 Outline permission granted for demolition of existing garages and erection of 3 storey block of 5 no.1 bedroom flats, 2 no.2 bedroom houses and 1 no.1 bedroom bungalow with formation of ancillary gardens/landscaping, access road, associated parking and cycle/bin store areas. 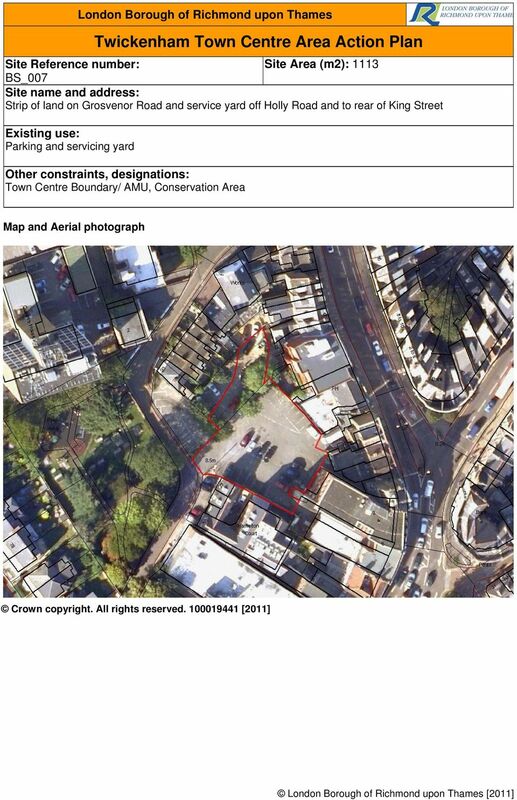 Just outside Twickenham Action Area and Town Centre Boundary/Area of Mixed Use. 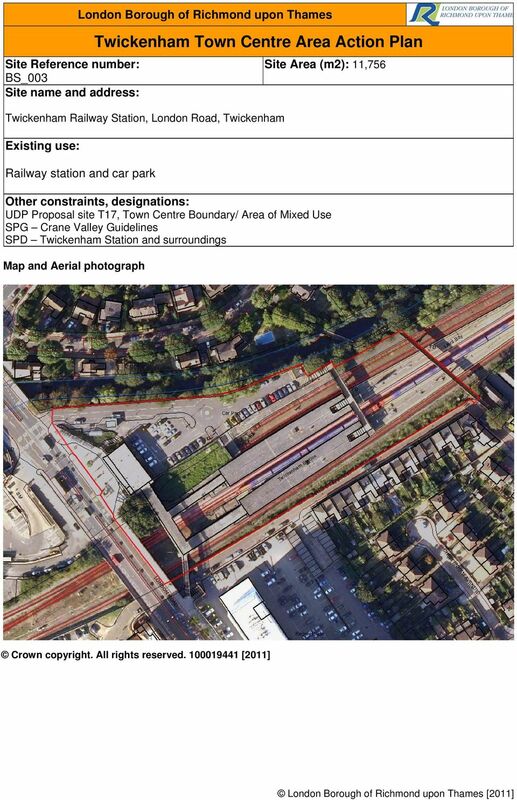 HS2 replacement homes: Introduction Camden has been actively opposing the Government s proposals for a new high speed railway from Euston to Birmingham due to the significant negative impacts on our communities. 18 Church Street. 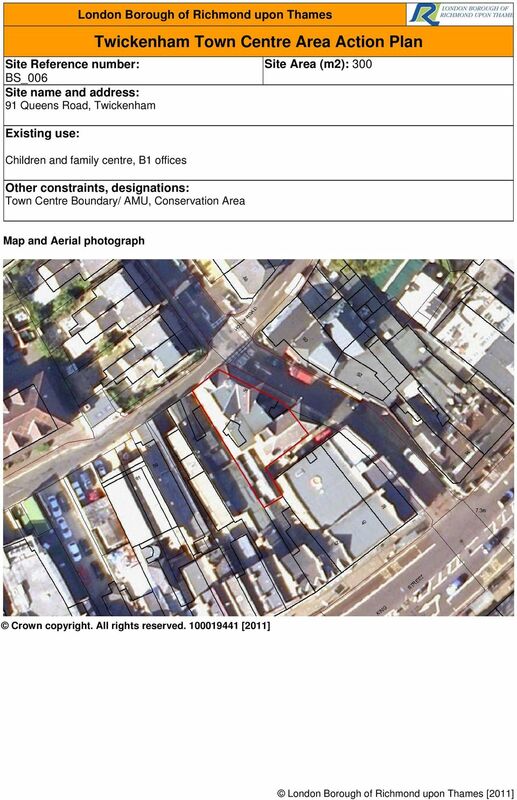 This building adjoins number 16 and is again a grade II listed building. The building has a ground floor shop with a flat above. 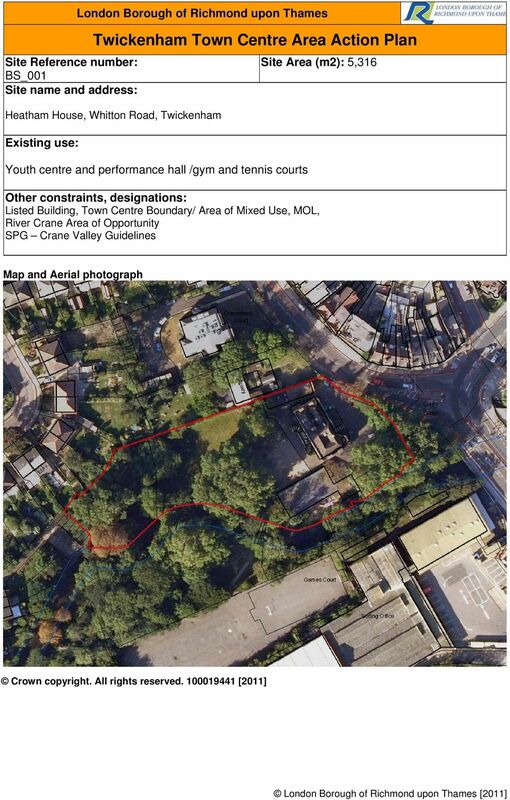 ideally located The surrounding area offers a wide variety of theatres, cycle parks and leisure centres with swimming pools and tennis courts. salmon fields A brief history At Salmon Fields you will find a quality development of four 4-bedroom Elegant Homes named after the affluent landowner Henry Salmon who owned the land in the 19th Century. HurlinghamRetailPark. 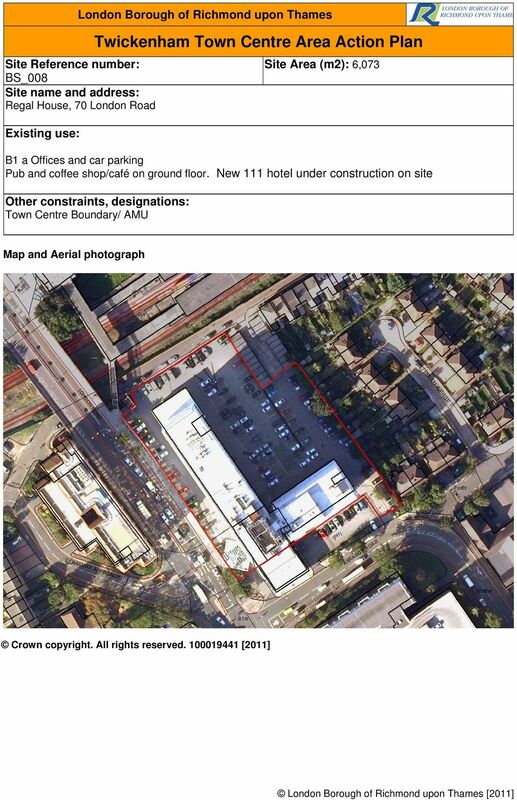 Aerial view of site. 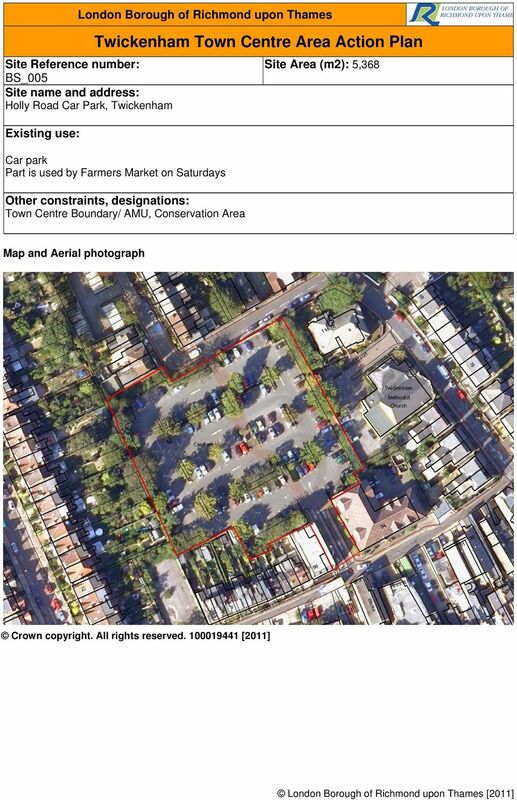 Welcome to our exhibition of proposals for the redevelopment of the Hurlingham Retail Park. 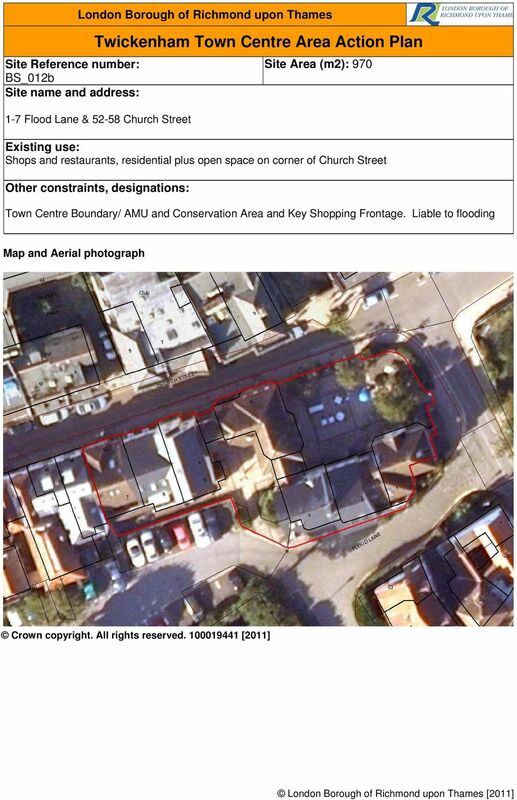 How are planning applications for houses in multiple occupation determined? 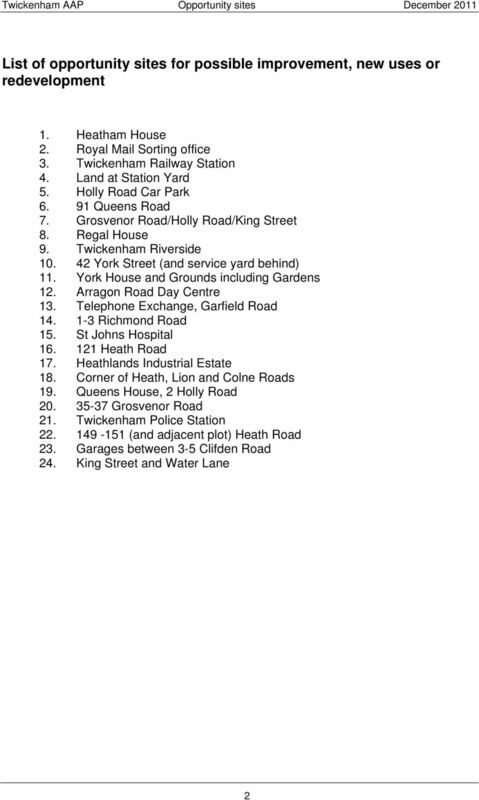 18-1 SECTION 18 - ZONE C-3: SETTLEMENT COMMERCIAL 18.1 Within a Zone C-3, no land shall be used and no building or structure shall be erected or used except for one or more of the listed in Column 1 below. IF YOU KNOW KENDAL ALREADY, YOU LL BE FAMILIAR WITH ITS HISTORICAL CHARM, VIBRANT CULTURE AND DISTINCTIVE CUMBRIAN CHARACTER.